I always find it funny that after having been around a lot of very big, strong, powerful natural lifters over the years that we all have a similar make up. Not in physical terms so much, but in mental terms. It seems to me that guys who go on to become incredibly strong all have one thing in common. The mental ability to believe they could set lofty goals, and then apply hard work and dedication into conquering them. Some people think if you build a decent amount of muscle or strength that it’s simply a case of having great genes and that it came easy for you. Why can’t it be that the people who go on achieve decent gains have a penchant for hard work to go along with sheer determination? Obviously training plays a big part. Even a guy with the best genes and a ton of determination will have trouble gaining on a routine that’s tailor made for drug users. It all has to come together. These are the parts that make the whole. Training = Is your workout geared specifically towards reaching your goals in an efficient manner? Goal Setting = Do you know what your short term and long term goals are and do you have a plan to reach them? Mental Focus = Are you applying yourself 100% to your sessions and making sure to milk each rep, set, and workout for all it’s worth? Diet = Does your diet go hand in hand to help accomplish your goals? Does it give you enough vitamins, minerals, protein, carbs, and fats to help fuel your workouts and help you recover? Recuperation = Are you getting enough sleep each night and enough rest between sessions? Dedication = Are you making sure that you don’t let trivial things interfere with your workouts? Are you making sure not to skip your sessions? All of the things on this list play a big part in reaching your goals. Look at the list and tell me; do you think it’s fair to point solely to your genes if all of the other things on this list are not in order? Don’t you think that, even with pretty lousy genes, you could build a lot of mass and power if you managed to get all of those things in order? I don’t think so; I know so. This is what separates the whiners and crybabies from the guys that go on to get big and strong. No one is asking you to be a hermit and only leave the house to go to work/school and the gym. You still have to have a life outside of your training for sure. In fact, extremely hard training can only be done infrequently so it lends itself to giving you more free time. But if you are serious in your training, and you really strive to become bigger and stronger, then you must not let trivial things impede your training. For example, you blow off a squat workout to go out drinking and fishing with your boys. Or you blow off a deadlift session to go shopping with your girlfriends. This is not acceptable. You can still go out with the boys, go fishing, or shopping. But you better get up early that morning and get your squat or deadlift workout done before you go. Then you’re free to do what you want the rest of the day. This means that training must have a solid place in your schedule. You can make a small change to fit your training in with the other aspects of your life so that you, nor anyone else, are ever inconvenienced by it. This let’s you continue on your quest of meeting your size and strength goals, and at the same time you don’t have to alter your personal life very much. A serious trainer will make these small adjustments so that he can continue on with his training and still have a life, a job, and some sanity. In all reality, if you’re a serious lifter with a lot of passion for the iron, then you are already used to making these minor adjustments in your life. If you haven’t been making these adjustments, and you are upset with your lack of progress, then maybe you need to sit down and think long and hard about just how important training is to you. Is it a past time or a hobby that you enjoy, but don’t really want to go very far in? Is training something that you do only when it’s convenient and can fit into your schedule? If so, then you are not a serious trainer and need to shut up, and quit whining about your lack of progress and make some changes. If spending the summer out chasing girls every waking moment, or going out every night to bars takes precedence over training, then don’t complain about a lack of progress. Please note again, that I’m not saying that you can’t do these things, but if they cut into your progress, then you need to decide what is more important. Either you want to be a serious lifter and begin making a plan to reach your goals, or you’re a recreational lifter who has no real interest in becoming big and strong. 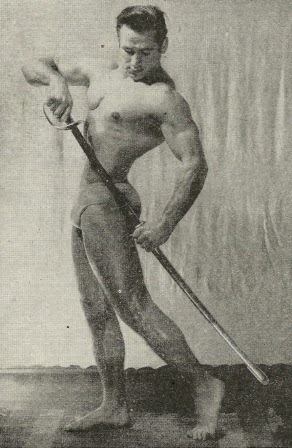 Stanczyk was no ordinary strongman. He was in the possession of extraordinary athletic ability and split second timing. But above all, he was a wonderful competitor and a good sport. Stan burst onto the national scene in 1942 by winning third place at that year's Senior Nationals as a lightweight (145 BWT) - only his third contest to date.